in 1976 she was serving five Unity churches in Texas—Abilene, Harlingen, McAllen, San Angelo and Tyler—while also serving as an assistant to Donald Curtis at Unity of Dallas. She “rode circuit” in a Merry Miler, purchased with her own funds, and she gave workshops and seminars all over the US and Great Britain, bringing the Unity message to areas where there was no Unity church. Have you ever wanted to be a Unity minister? Marge Kass just may be the perfect role model. Marge will be 92 years old this June (2013). She’s retired but active and living in Baton Rouge, where she founded the first Unity church there. Listen to her seminar. It's two hours and fifteen minutes long. I've got it segmented into 30 clips so you can listen a little bit at a time. You can also download the MP3 audio file for your smartphone or tablet. She teaches by sharing her own life. She's honest and loving. Her story is amazing. Go buy a nice Thank You card. Write her a note and send it to her in care of: Unity Church of Christianity in Baton Rouge; 15255 Jefferson Hwy; Baton Rouge, LA 70817. The staff there will take it over to her at the rest home. Why? Listen to clip #26 and you'll know exactly why. 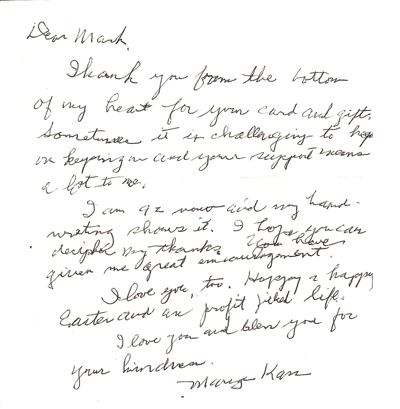 (Marge Kass made her transition May 23, 2013). If you are the editor of your church's Sunday bulletin, download the graphic about the Joy Dynamics seminar and paste it in your bulletin. Share Marge with your congregation. Also, if you know Marge, add a comment at the bottom of this page. If you know anyone knows Marge, forward this page on to them. Marge became a Unity minister in 1963. She served with Rev. Dr. Curtis in Dallas for two years, then felt the calling to go on the road and minister to small groups/churches. She became a circuit rider going around the US, Canada and England giving workshops and seminars. Marge did this for six years then had to reduce the travel due to an arthritic hip. She came to Baton Rouge for a workshop and met a doctor who helped with her hip. She left to give another workshop and while traveling, the doctor called and asked if she would become the Unity minister in Baton Rouge. 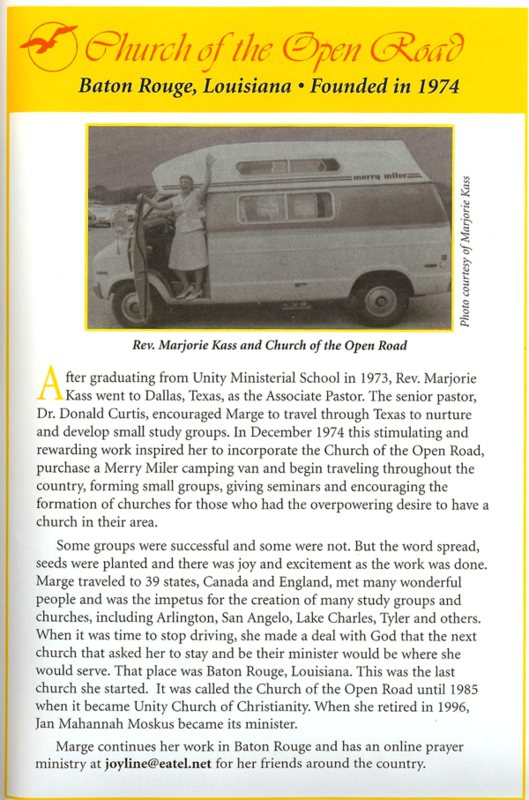 She called the church The Church of the Open Road and became the first Unity minister in Baton Rouge in 1969. She continued to do some traveling in the Southeast. Marge finally retired from the Unity Church of Christianity in Baton Rouge in 1997. Rev. Marge Kass will be 92 years young in June 2013. She resides at the Ollie Steele Burden Retirement Center in Baton Rouge where she remains active and occasionally visits the church for Sunday service. Rev. Marge is still loved by the congregation and many ministers/speakers who come to the church and ask about her. Marjorie Conner Kass was founder of Unity Church of Christianity in Baton Rouge and was a maverick minister of the Church of the Open Road. She passed on May 23 at Ollie Steele Burden Manor Nursing Home. She was 91 years old. She served at Unity Church in Baton Rouge, where she served as pastor from 1978 until 1997; and at numerous other churches that she helped establish. 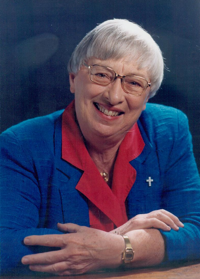 Born in Syracuse, New York to Florence and Charles Conner, Marge was a music education graduate of Syracuse University, and was later ordained by the Unity School of Christianity. She worked as a public school teacher and Minister of Music in the Florida Methodist Conference, and organist for in Ft. Lauderdale for over 25 years. Ordained by Unity in 1971, she then served at the Unity Church in Dallas, TX for two years before establishing the Church of the Open Road. She developed the “Joy Dynamics” seminar, and took her message to 39 states, Canada, and England. Marge Kass is a modern circuit rider, and she travels to cities and small communities, and she is moved by the spirit. She continues, “It truly is a spirit thing: something inside is pushing. This is not what I would have chosen to do 10 years ago, but it is what I do and enjoy doing now.” Rev. Kass spoke and presented a “Joy Dynamics Seminar” during the past week at First Unity Temple. “The seminars are the means of raising money to take Unity teachings to people who would not otherwise be able to have them,” she explained. I was the associate minister in the Dallas Unity Church. The minister there drew people from miles around, and they said “I wish there were something like that where I live.” So, I began to move out from Dallas, and the Church of the Open Road gradually evolved. It is a real church; incorporated, and I hold services in homes, church buildings or rented rooms. The Joy Seminars, she said, stress looking at one’s self and learning to know one’s self; understanding what makes us do the things we do. “Underneath is the Kingdom of Heaven,” she said. “We have been conditioned by the things which have happened to us. She said, “I teach that when you find something in yourself that you don’t like you can let it go.” “Letting it go”, in Rev. Kass’s terms is a positive thing, but instead a simple putting aside, as in her example of the “concern can.” “I tell people to put a “concern can” on the kitchen shelf. Then to put all their concerns into it and forget them. Then, take them out once a week and look at them, but don”t give them any more than that.” One may have a responsible concern, when it is a appropriate, she believes, but it is not necessary to devote one”s entire energy to it, even it it involves tragedy. MRS KASS SAID she “thought her way out” of the Methodist Church where she had been a member most of her life, and where she had been minister of music for many years. John Wesley taught “think and let think.” This means each person should follow his own inner guide, and let others do the same. I had spent a lot of time studying religious science, theosophy, all the things we loosely define as “new thought.” Then I had an inner experience, which led me to Unity, influenced by my experiences while organist at Temple Emanu-el Reform Jewish congregation at Ft. Lauderdale. “GOD IS ONE” is one of the Jewish teachings. One God. Unity. I began to study. 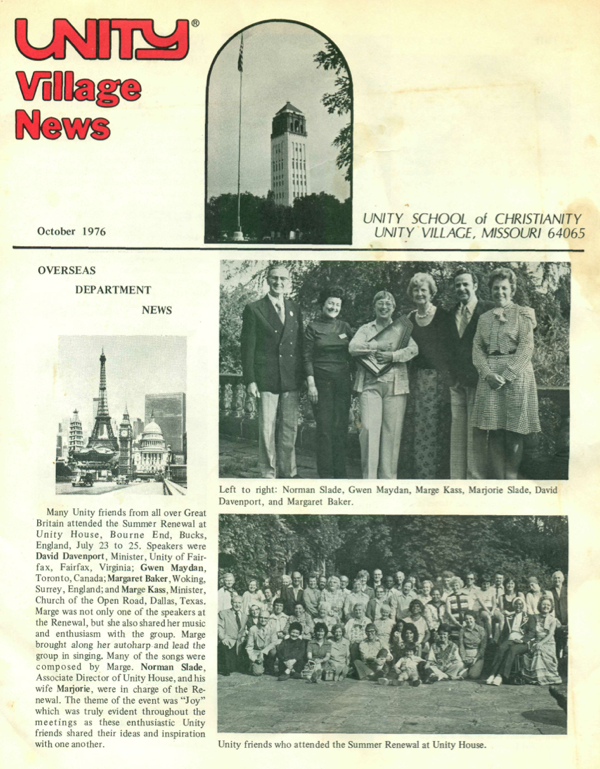 She enrolled in the School of Ministerial and Religious Studies, Unity Village, Mo., and was ordained a Unity minister in 1973 [Front row, 3rd from left]. People today are hung up on fears, particularly the fear they must always please others. Another hangup is “always knowing what others should do.” We can't. We are lucky if we know that we should do. We become angry if our rights are stepped on. Many people are seeking the wrong things, asking the wrong question. When I lead a seminar, I don't feel as if I am teaching; only showing others where I have been. We learn to know ourselves. Why do we get angry? Is it because someone is putting us down? It takes self-observations and loving ourselves and making ourselves O.K. Learning the light touch and watching ourselves enjoy life. People are looking for comfort and freedom from fear. These are both illusions. 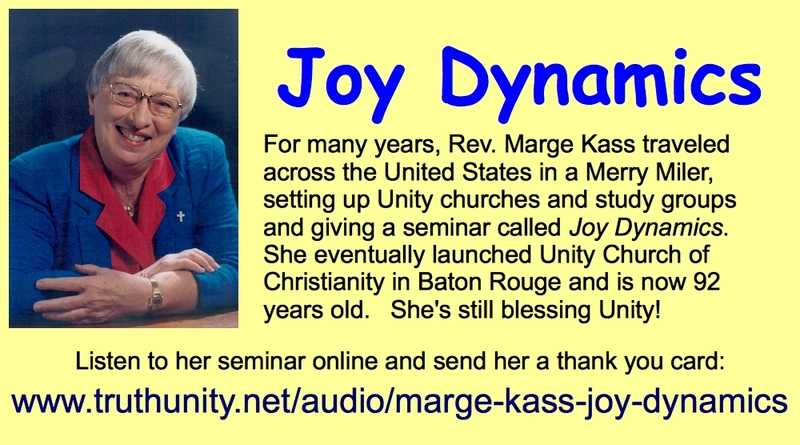 If you have been blessed by Marge and her Joy Dynamics Seminar, then why not make an offering to Unity Church of Christianity in Baton Rouge, the church she founded and the church that continues to be her loving community? This was awesome!!!!!! Thank you for these amazing words...your seminar was a booster to my faith. God bless you, Marge!!! Thank you Marge for Time well Spent. Thank you for a wise choice. How beautiful are the feet of those who serve the Lord.